The Hard Work is Done. The Exoconscious Creative Building Begins. The hard work of pulling apart the matrix used to be aggravating, mesmerizing and often in the end futile. Yet, for many of us the hard work of matrix demystifying is done. We can put down our chattering minds and easily pull the threads of thought, word and deed that defined a matrix that is dissolving. With the ease of demystifying comes our new work–the work of Exoconscious creative living. Here’s an example of how easy it is to peer through the holes in our former fabric. Pulling apart gateways as we move through. 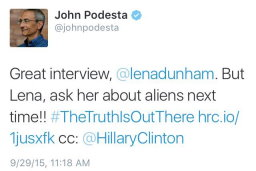 Podesta’s most recent Tweet directs actress Lena Dunham to ask Hillary about aliens. 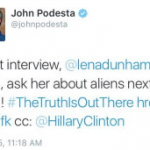 This is the fourth time Podesta has raised the ET matter in a public forum since 2002. Victor Viggiani and Steve Bassett retweeted Podesta and refined his message. As Podesta’s political tweet held our attention another event unfolded. 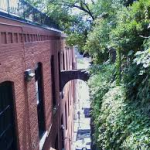 Upon the Pope’s departure from DC, the city is hosting (pardon the religious pun) a commemoration of the “Exorcist” Jesuit steps at Georgetown. I’m not sure what they are commemorating, calling to our minds….but something that’s important to them. Something they want to celebrate with ceremony. Maybe Jesuit alumni John Podesta will be in attendance. Maybe he will tweet. DC used to be a quiet, conservative town until it too swallowed the PR pill of social media. Now there are way too many fun threads to pull open the fabric of our matrix. Peekaboo. 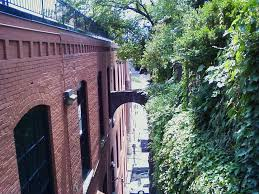 Question: In Jesuit Georgetown is DC commemorating a Stare Way or a Stairway? Answer: It no longer matters. If others want to be mesmerized, stare, then fine. That’s their choice. It is not ours. 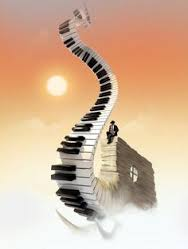 We are way beyond the staircase and the rabbit hole. Our hard work of deciphering is dead and dying, done. We now open our hearts and minds to who we are as Exoconscious. We start the fun work of building a reality aware of our connection and communication to our ET Self. Alive. Conscious. Exoconscious.